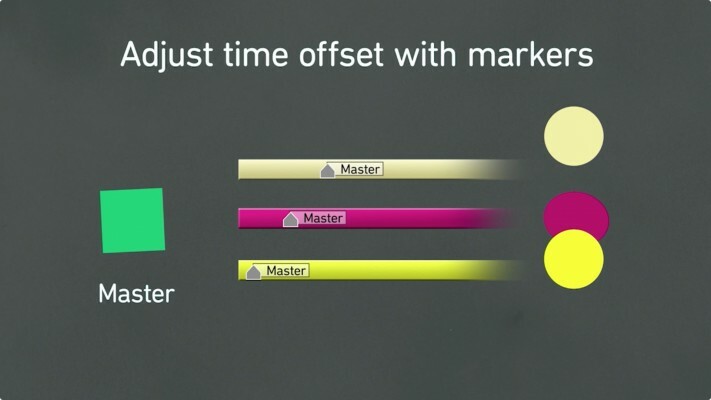 Adjust time offset with markers - No need to even look at the keyframes! If you find yourself duplicating and offsetting over and over, use Parrot and never paint yourself into a corner again. 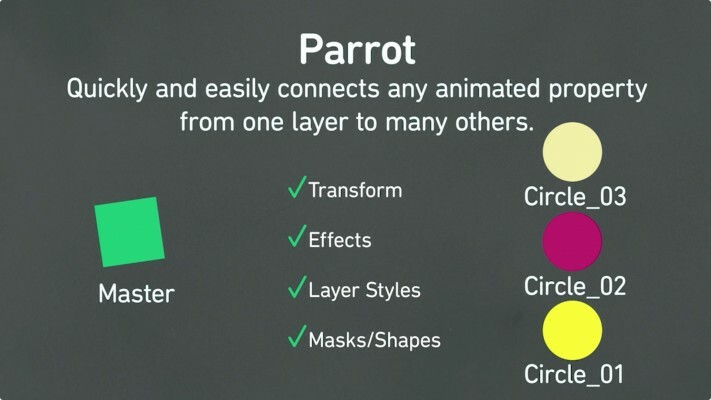 Parrot allows you to designate a layer to be your "Human", or motion master. On this layer you can animate motion, effects, masks, shapes, and layer styles. The keyframed animation that you create can be passed on to other layers and triggered by layer markers. This way you can quickly set up your "parrots" and finesse your motion later by just revising your source layer. Your source layer can be 2D or 3D (dimensions separated or not). Parrot will do its best to conform your target layers to your source layer. 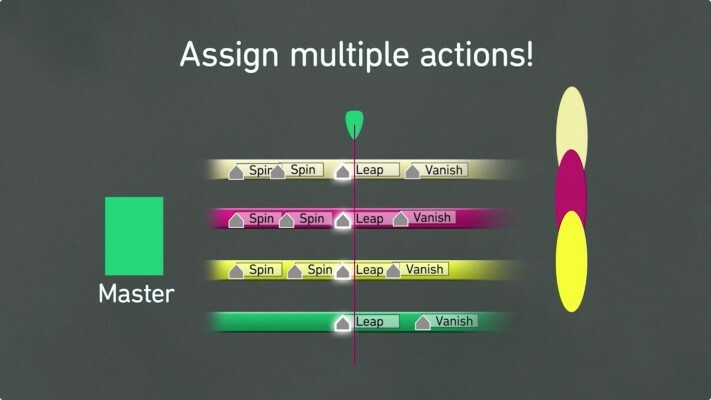 You can trigger your actions many times over just by adding new layer markers. Parrot comes with a simple set of marker management tools to help with creating markers on many layers with specific offsets and names in one click. Your source layer can contain more than one action. By adding a named marker on your source layer, you can designate a new event. Call that event on a source layer by giving it a layer marker of the same name. Additionally, you can choose to use the Dynamic Offset in your master layer. This will disregard marker information and just offset animation on your layers by the slider value for super quick feedback. What are the differences between the trial and licensed version? The trial lets you try out Parrot for ten days. Marker Management tools are locked. In the Parrot UI, click the Help "?" button to see how much time you have left in your trial. The licensed version unlocks the powerful Marker Management tools and of course has no time limit. Do my colleagues/clients need to have Parrot installed to open my projects that use it? No, the setups that you build with Parrot will work on any machine. A quick overview of the new "Position Offset from Master Start" option. Fixed some small bugs with separated dimensions. Removed the note layer checkbox. Fixed MatchName expressions for international users.